We are excited to announce our partnership with 2X Software, a provider of server based and virtual computing solutions. 2X Software selected eG Innovations to offer best-of-breed monitoring and performance management capabilities for 2X ApplicationServer XG environments. This allows 2X customers to identify and repair performance issues pre-emptively, before they impact business continuity and user satisfaction. A growing number of administrators are relying on 2X ApplicationServer XG for quick and reliable virtual desktop and application delivery. Performance failures often have a terrible effect on user experience and organizational effectiveness. Many times, the cause of such failures cannot be easily pinpointed, especially in dynamic virtualized environments, making recovery difficult. eG 2X Monitoring provides total performance visibility for 2X installations of all sizes, providing a comprehensive management solution for 2X farms, with complete visibility and monitoring for all layers and tiers of the organization’s 2X infrastructure. Monitored layers include the network, servers, virtualization platform, storage and more. 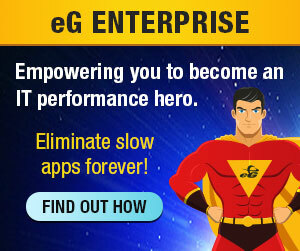 With eG 2X Monitoring, administrators can dramatically accelerate the discovery, diagnosis and resolution of performance issues to improve the end-user experience within virtual, cloud and physical infrastructures. Total Performance Visibility – Each service layer and tier is monitored – from desktops to applications, and from the network to storage – so administrators know what’s working and what isn’t. Proactive Issue Detection and Resolution – Allows 2X environment performance to be auto-baselined, sending proactive alerts when infrastructure usage and performance are abnormal; and administrators can automatically correlate performance events across the service environment, and identify and diagnose issues before users call the helpdesk. User Session and Application Performance Diagnosis – In-depth user session visibility allows administrators to diagnose abnormal user sessions and misbehaving applications. Powerful Reporting & Analytics – Pinpoint performance bottlenecks in 2X environments, identify excessive users, and load intensive applications – helping you to right-size your IT environment and get better return out of your IT investments. For more information, please download the eG 2X Monitoring Solution Brief.